Robyn at Boston Calling. Photos by Andy Moran. After yesterday’s back-to-back rollout of entertainment-heavy performances, festivalgoers were right to assume Boston Calling’s second day would provide just as much to chew on. What the festival offered instead, however, was a series of changes. There was no abrupt need to accept them (Sorry, Bowie). These were acts of reinvention, artists in transition from their bedroom-bound selves to musicians big enough to face a sea of people onstage. Altercations should be expected when looking at growth, and in music, there’s a right to reinvent yourself. The difficulty comes not with how far a musician pushes themselves, but the degree to which fans accept that push. For those looking to transition to a larger persona, it’s easy to accept their progression. Local opener Palehound took the stage with a bit of fear, wasting no time openly admitting her nerves, but ended it with clear confidence. With new cuts like “Cinnamon” and “Molly” on through to old favorite “Pet Carrot”, she used her guitar skills and addictive vocals—especially when yelling mid-song—to put a foot down in favor of more attention. The same holds true for Lizzo, the Minneapolis-based rapper who burst onstage with enough power and enthusiasm to merit a significantly later spot on the lineup. With a live DJ and backup dancers of all sizes, Lizzo crafted a set full of body positivity, female empowerment, and good vibes at its most basic. Both women are ready for the spotlight and, as their sets confirmed, have both the live energy and engagement to claim it come the end of the year, if not sooner. Reinvention isn’t always for the better. The Vaccines and City and Colour both ditched the succinct hooks that saw their earlier work catch waves of success. Despite nabbing longer time slots in the schedule, both sported updated takes on their own music which doubled as a time to hit the bathroom or grab lunch, coming across like a watered down Arctic Monkeys set and a ‘90s rock singer-songwriter record stuck looping, respectively. BØRNS launched into a hybrid cover of Arcade Fire and David Bowie in an attempt to win over those unphased by one-hit wonders. It didn’t work. Even Miike Snow’s shift into slightly more electronic work left the crowd lukewarm, most only throwing their arms up when the megatron camera panned to them in the audience or, alternatively, one of their few older songs snuck into the setlist. Not everyone looked eager to alter themselves. Locals Nemes and Lady Pills fit comfortably on the small Verizon stage, roping casual onlookers with their folk rock and punk rock songs respectively. Performing at the festival alone was a big step for them. Shifting their styles would have been too much. Electropop duo ODESZA found their voice about three years ago and polish it on the regular ever since then. The two combine trip-hop elements with live horn, instrumental, and string recordings, sharing a mix of joy-centered, bass-heavy beats that are equally as easy to dance to as they are to bob along to gently. Courtney Barnett used her now-honed talent to deliver witty lyrics and straightforward riffs with total charm. Even Battles, the math rock trio who took a long break from performing, did little to modify their setlist, though there’s not much they can do to change their performance style given a good portion is prerecorded and staying on tempo is a must in order for each part to align properly. Those content with where they are saw no need to change their gameplan – and fans could interact with that material as they saw fit. Leave it to the headliner to find true satisfaction in her own reinvention – but at a cost. A large crowd staked out spots at the main stage almost two hours before Robyn was set to perform. Large mirrors scattered the stage, an elevated platform in the center on which she would stand. Once the sun had set, a remix of “Who Do You Love” kicked off the performance and she waltzed out in an orange coat and long, white, Spanish-styled pants – and after a few large waves of cheering, the crowd grew relatively silent. The Swedish vocalist committed to a continuous dance set of entirely remixed tracks. That’s what her music’s for, dancing, but to this audience, it wasn’t how they wanted to dance. Blame it on the 90-degree weather all day. Blame it on the lack of breaks between songs. Blame it on whatever you want. No matter the reason, the majority of the crowd refused to dance to what she prepared: a remarkable curation of variations of her songs, most unraveling like deep house cuts and minimalist dance numbers – all perfect for fans who want to stay footloose all night. Barely five songs in, the crowd thinned considerably, leaving a pool of drunk onlookers ready to dance to anything and diehard fans waiting for Robyn to say it’s all a joke, to lean heavy into the synths, to play their favorite club hits exactly the way they want to hear them. Except for her collaboration with Royksopp on an EP, she hasn’t released an album since 2010. Expecting her to remain content with that material six years later is childish. 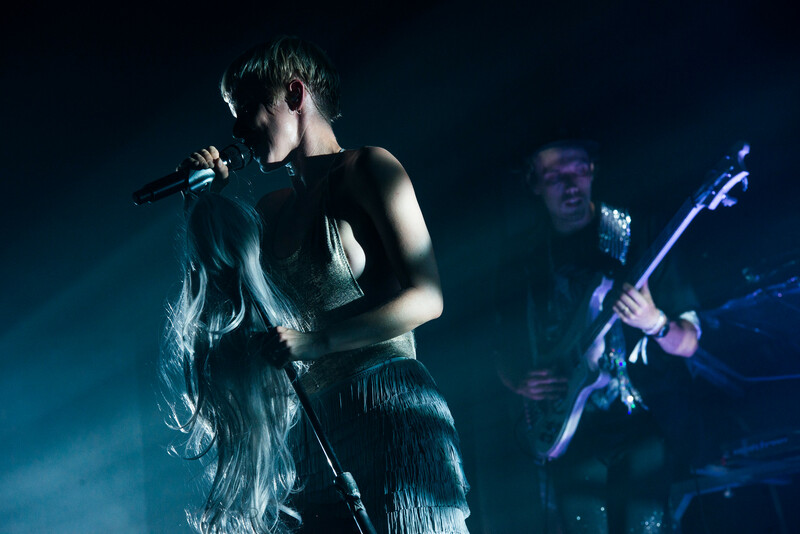 Getting to see Robyn perform them with gusto, and with such vibrant reimaginings, was a treat. It was a reinvention which felt right, but fans weren’t ready yet. Hopefully day three sees an acceptance of change on both the musicians’ and fans’ end.